One place that no tourist would miss in Kyoto is spending an evening in Gion (祇園) – a place best known as the district where geishas reside, entertain, wait to be ‘rescued’ by their patrons, and where maikos learn their art while serving the needs of their bigger sisters. And if you have read or watched ‘Memoirs of the Geisha’, a visit to Gion must be in the cards. There is much to do here – shopping for scarves and superbly made canvas totes, having kaiseki dinner (懐石料理) in the famous geisha quarters at Hanamichi (花道小路), exploring the most beautiful street in Kyoto near the babbling brook of Shirakawa (白川), and watching the sunset over Gion Shrine (八坂神社 / 祇園神社). To leisurely enjoy the sights and experiences that Gion has to offer, I would suggest heading to Gion in late afternoon to get some shopping done, and then enjoy a stroll to catch the sun setting over Shirakawa and Gion Shrine, before dinner at one of those nostalgic restaurants along Hanamichi which will bring you back in time. In this place where geishas and maikos live, learn their trade, and work, it is steeped in the culture and history of these artisans. What are sold here is a reflection of their daily living essentials, their food preferences, and their fashion and skincare. It was almost an anthropological journey if I dare say. Play kimono dress-up and get a taste of how it is like to walk in those wooden clogs, bun up your hair, and plaster on their skin-whitening (literally) make-up. There are many studios to choose from. Do your research prior, and be prepared to pay a price to rent the kimonos. Of course, you would have a picture or two to show off to your friends back home. This is most probably most crowded Yōjiya (よーじや) you will see in all of Kyoto. You will not miss it. Just look out for their iconic logo. This brand is uniquely Kyoto and its products are good buys for female friends back home. A shop that sells skincare and beauty products made from natural ingredients, many ladies clamor to get a few products home, in hope of nurturing porcelain, smooth skin that geishas and maikos are famous for. It’s like fabric heaven for me! I couldn’t leave without getting one for myself and my fabric- and prints-loving friend. They have these fantastic prints and fabric made into different lengths of stoles, scarves, handkerchiefs, pouches, bags and bento wrappers. With a long history of over 400 years, their traditional and contemporary prints remain popular with locals and tourists and makes for a good souvenir to bring back as a keepsake. Must Buy: Stole in a print that you love. The above is the one I bought for myself – cute raindrops! My love for granny’s purses – in all shapes and sizes, made Ayanokoji (あやの小路) a delightful discovery. Handmade from pretty and sturdy fabric, the workmanship is intricate. There are so many types of bags, purses, pouches, and cases to choose from! So many have tried to emulate Ichizawa Shinzaburo Hanpu (一澤信三郎帆布). In fact, I saw some emulators in Taipei on my recent trip. Of course, we have got to witness why their canvas totes and backpacks are so sought after by the Japanese people and fans from all over the world. 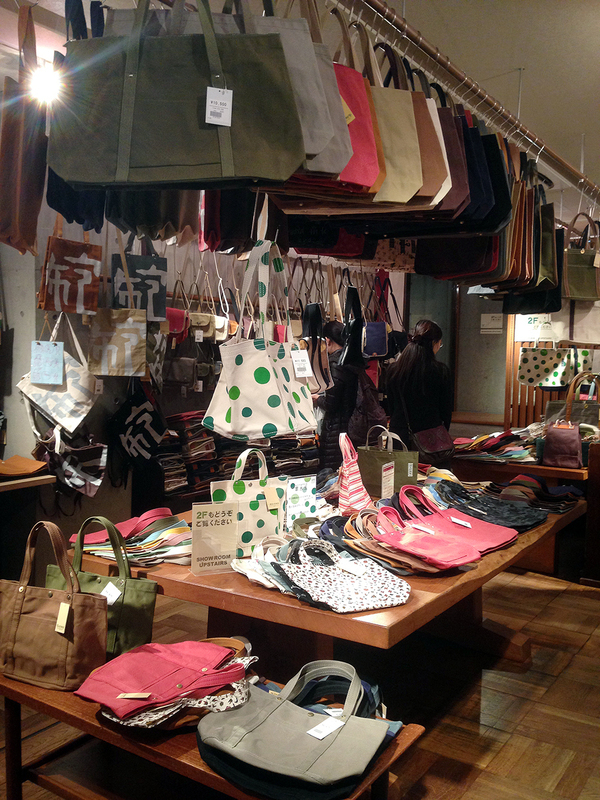 Yes, there is only 1 shop in the whole of Japan, and only in Kyoto. They have been around since 1905. After a long walk, we chanced upon the workshop, where 2 elderly craftsmen gave us a warning glare, seemingly telling us not to disrupt their work. Please refrain from walking into the workshop and really disturbing them by asking for directions. The shop was further up, which we found pretty quickly, thanks to the notice on the sliding door of the workshop. After entering, we are greeted by a large collection of tote bags, from small ones good for carrying your lunchboxes, to big ones good enough for travel. There are also camera bags and sling bags. Be sure to walk up to the second level where you will find backpacks and handbags. All of the bags are made of strong, sturdy canvas materials. Their bags are extremely well-made, crafted with care and using the best canvas material and fastenings. Not a stitch is out of place. The design and structure is sound, especially for backpacks, which tend to lose its shape after some time. It is no wonder why the Japanese are themselves fans of this shop. They are closed on Tuesdays, and directions can be found on their website. I always buy back the Nama Yatsuhashi (生八つ橋) in chocolate and matcha flavors from Gion. It’s mochi wrapped with either red bean, green tea paste, black sesame paste or chocolate paste. The source of Nama Yatsuhashi can be found in Gion, and if you love mochi, it is a must-buy. Have it with a warm cup of green tea. It’s heavenly! Remember to always check the expiry dates. Japanese food is often made with no preservatives, so they do not keep as long as most processed food. They would also have shorter expiry dates. You wouldn’t want to bring home a box of sweets only to discover that it had already passed its expiry date. A lesson learned for me when I had to down a whole box of dessert before I flew home. Thanks so much for this! Bought some stuff from Raak and Yojija – am in Kyoto on holiday right now! Everything in Raak is so tempting though, spent about an hour choosing!!! Thank you so much for leaving such a lovely comment! I’m glad you find the post useful. 🙂 Me too! I spent such a long time in Raak, just selecting fabric prints and gifts for friends. Enjoy your holidays! I’m envious. Hope I can make a trip to Kyoto soon. I still have so much from my last trips to share.